By far the largest community in Project Controls in the world (150,000+ registered members) Planning Planet (PP) offers a unique opportunity to communicate with a high spending, product hungry, global marketplace as economically as possible - from your desk. PP is a globally respected brand we have been in existence since 2000 and are known as the first resource for teams of Practitioners across 17 industries from Oil and Gas to Construction, Transport Manufacturing, Utilities and Heavy Civil Engineering the vast majority of Practitioners know of Planning Planet irrespective of their industry and their global location. Our forums enjoy millions of visits each year with a wide variety of content available - reflecting the scope of the industry itself. The mentality of our members is to garner knowledge and expertise to help them in their roles - members are the cream of the industry usually communicating within their own team but taking the trouble to partake in Planning Planet to increase their worth to their employers or colleagues. PP Gatherings are organised globally and hosted by a local PP member with attendees registering through Planning Planet. Gatherings are vibrant communities of Practitioners who meet to exchange views and ideas usually on a monthly basis - lists of Gatherings and organisers are listed on the website. PP is a Community website it is free to join and is run by Project Controls Practitioners - people who have many years of experience in the industry and our content bears this out. Our advertisers form an important part of our offering, we partner with vendors we know will make a difference to our members. We invite our advertisers to become involved in our community and benefit from the loyalty our members show to Planning Planet. Of course, we are ALWAYS open to ideas to further enhance our products for our Advertisers! The numbers shown here are our COMMUNITY GEOGRAPHIC SPREAD Google Analytics for the period 20 July to 20 August 2018. The data documents the the 116,845 user sessions by 89,387 different individuals during this one month period. The numbers shown here are our DISCUSSION FORUM ADVERTISEMENT Google Analytics for the period 20 July to 20 August 2018. 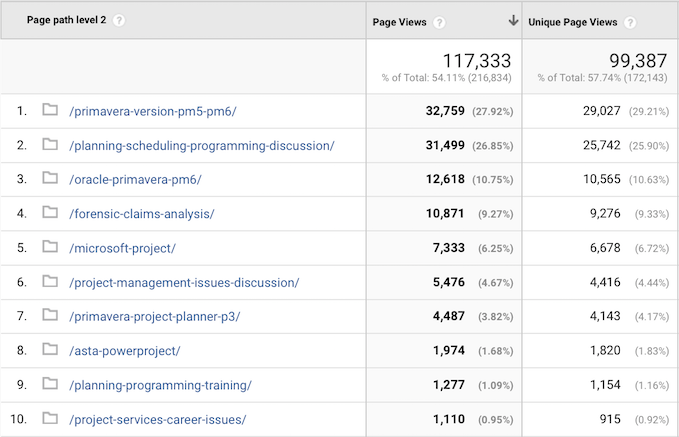 The data documents the the 117,333 page views seen by 99,387 different individuals during this one month period. Obviously, there are many more things we could offer (sponsoring gatherings, UTILISING YOUR MAILING LIST and OURS so your clients receive information from a different source, etc) get in touch - let’s transform your image to the largest online community in Project Controls BY THE MOST EFFECTIVE METHOD - contact the world FROM YOUR DESK! Email Planning Planet on PPAdmin@planningplanet.com for a discussion.